When it comes to selling online, you don’t have the benefit of being able to persuade someone by talking face to face. Instead, you have to rely on your website to sell for you. Website design is essential for encouraging customers to convert, but so is copy. Sales copy can have an enormous impact on conversion rates and overall sales. It has the power to determine whether an e-commerce brand is successful. Not convinced? Online retailers as diverse as productivity software Highrise and Encyclopaedia Britannica have increased conversion rates by between 30 and 100 percent by optimizing their web copy. But sales copy isn’t easy to create. 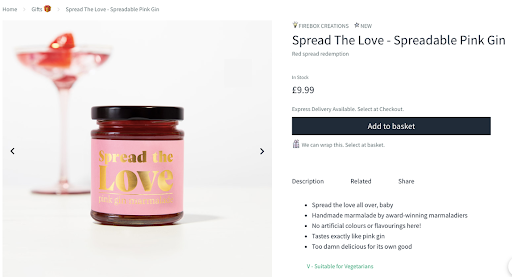 Writing unique product descriptions for hundreds or thousands of online products can be overwhelming for retailers, never mind conceptualizing a brand voice and coming up with clever taglines. So what’s an online retailer to do? Thankfully, creating conversion-oriented sales copy of your own is possible by following a few easy guidelines. In this post, we’ll start by explaining the what and why of sales copy, before using eight inspiring examples to reveal how to create copy that drives conversions. Sales copy is the words a retailer or brand use to persuade a potential customer to take an action. You can find sales copy on websites, in emails, in product descriptions, and even in social media status updates. What does this copy encourage people to do? It could be to buy a product, sign up for a mailing list, register for a webinar, or find out about your brand’s services. When it comes to the writing on your site, you’re likely to hear the words copy and content used nearly interchangeably. Are they really all that different? Yes, and no. Copy is text used to sell, or to persuade people to take an action. Content is text that informs, instills loyalty to a brand, inspires, or instructs. Both are designed to connect with a specific audience. E-commerce sites can and often do use both content and sales copy to move customers down the funnel. The example of Net a Porter/Porter Edit below shows content drawing shoppers in and building the brand, and then sales copy persuading them to purchase. In theory, marketers would produce content, and specialized copywriters would produce sales copy. In the real world, however, that distinction often isn’t upheld. Often, marketers find themselves writing both content and sales copy. Good sales copy differentiates you from competitors, anticipates customer questions or objections, and explains the benefits of a product. When done correctly, e-commerce sales copy has the added benefit of increasing your search engine rankings. Most importantly, sales copy has a tangible impact on revenue. 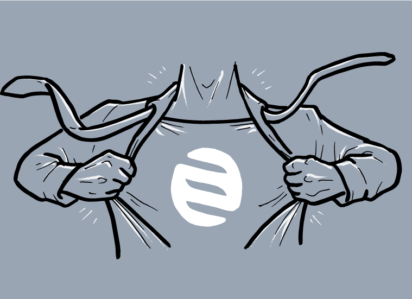 Unbounce found that changing the sales copy on its website led to a 20 percent increase in newsletter subscriptions. Freckle increased conversion rates from its homepage by 2.4 times by improving copy. Create buyer personas around different customer segments and the context in which they make purchase decisions. Establish a brand tone of voice that speaks to different customer segments, as well as contexts. For example, your brand should speak to a 45-year-old female executive in one way when she’s in the office making professional purchase decisions, and in another when she’s scrolling through her personal Instagram. Same buyer, different context. Lead with product/service benefits to the customer. Pro-tip: after you draft sales copy, do a Ctrl F and search for all pronouns ‘I’ and ‘we’; compare that to the number of times your copy contains ‘you’ and ‘your’. If you’re talking about yourself more than the customer, you’re not leading with the benefits. Describe products clearly. Preempt possible barriers to sale in product descriptions. Format descriptions so they’re scannable, with key details highlighted. Lead with action words, and not just in CTAs. Verbs should outnumber adjectives in most sales copy, although some brands, from food or beverage e-tailers for example, see results from sensory-filled product descriptions. Follow e-commerce SEO best practices. Be sure to employ keyword-optimized text, unique product descriptions, and comprehensive internal linking strategies. Canada-based NOVO Watches uses reclaimed railroads, heirlooms, and even tanks to make customized watches by hand. The sales copy reinforces the brand’s focus on history, tradition, and continuity. This description evokes the time, energy, and history that went into the product, encouraging the prospective customer to appreciate it, and ultimately buy it. How to implement this in your site’s sales copy: First, be clear about what makes your brand unique. Bring the manufacturing process into the copy and connect the products to their human creators. Find out how to tell a convincing brand story with this post. 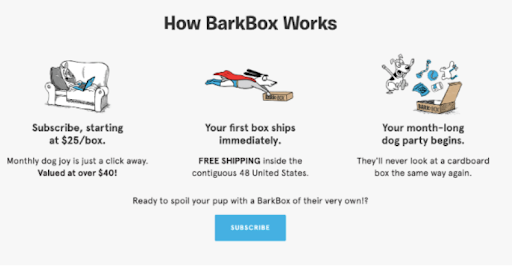 BarkBox has a strong brand voice that resonates with their target audience of dog-lovers. The brand uses playful references to how people talk to their dogs to sell their monthly canine subscription boxes. The sales copy is straightforward, making it easy for people to understand. But it’s also got a healthy dose of play, which feels just right for a dog-oriented product. The copy even extends to the website’s animations, and to Scout, the site’s helpful dog-bot. Copywriter Joanna Wiebe explains this three-step process and how to use customer voices in sales copy. The more technical the product, the simpler the explanation needs to be. Dyson pulls that off perfectly with their benefits-led product descriptions that condense cutting-edge technology into comprehensible chunks. 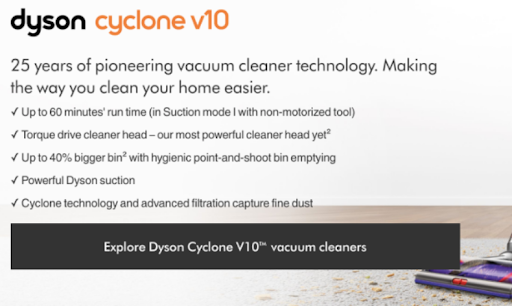 Rather than overwhelming potential customers with paragraphs of text, Dyson uses a bullet point list to make copy easy to understand quickly. How to implement this in your site’s sales copy: Present tech features as the solution to problems. Difficult to empty a vacuum cleaner bag into the trash? Dyson’s new tech solves that problem. Everyone cites Firebox as having stellar e-commerce sales copy—and for good reason. The gift brand’s striking product titles work for both SEO and consumers, describing the product while strengthening brand voice. Plowing energy into headlines and product titles makes sense: according to Copyblogger 8 out of 10 people will read headline copy, but only 2 out of 10 will read the rest. How to implement this in your site’s sales copy: To get away with daring copy like this, brands need to establish and enforce a clearly delineated brand voice. That entails slicing the company’s mission statement with customer needs and market orientation, then building that information into a brand voice chart. On a granular level, even the snappiest product page copy still needs to include all the essential information for shoppers, including allergy information, delivery policies, and sizing. Loaf’s whole web copy is coherent and sales-oriented. 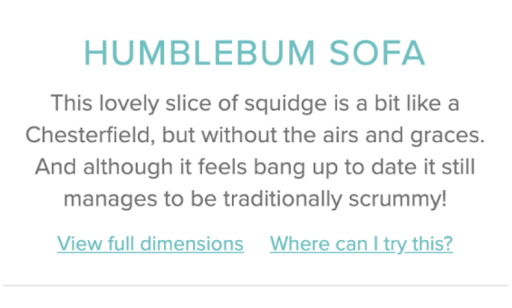 The homepage title “SOFAS FOR LOAFERS,” tells you exactly who the buyer persona is, and sets the tone for the whole site’s copy: relaxed and conversational, like a friendly chat on one of their sofas. Their product descriptions preempt possible buyer objections for big-ticket items like sofas—delivery is painless, and you can try the item in-store before you buy. Loaf copy reassures potential customers while still staying true to the chatty brand voice. How to implement this in your site’s sales copy: Brainstorm possible buyer objections: on expensive products, that could be price and payment method; on cheaper items, it could be returns policy or postage cost. Include solutions in the product copy. For example, offer alternative financing if shoppers might balk at a big-ticket purchase. Find out how furniture retailer The Original ScrapBox increases conversions with alternative financing. E-commerce sales copy for food and beverage retailers is tricky. How do you convey flavor without getting too verbose? 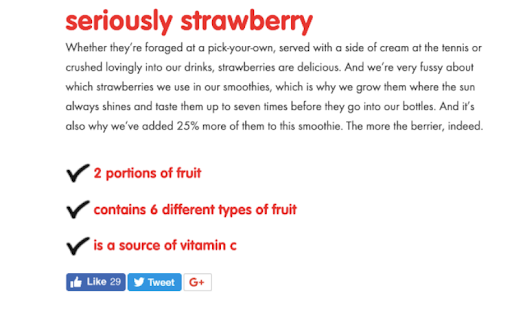 Innocent Smoothies circumvent the problem by evoking the experiences around the fruit in their beverages, rather than the flavor. For example, when selling a strawberry smoothie, the brand evokes the feeling of strawberry picking, rather than the flavor itself. In particular, the brand highlights growing strawberries in sunshine-y places and foraging for your own. How to implement this in your site’s sales copy: To create evocative sales copy, try to associate certain products with certain buyer personas, contexts and word-lists. Create word-clouds around product categories—in Innocent Smoothie’s case, the wider brand word-cloud might look like this: smoothies-summer-detox-freshness. And the strawberry smoothie word-cloud might be something like: tennis-fruitpicking-sunshine. When it comes to fashion e-commerce, editorial content can have just as big an impact on the bottom line as sales copy. Of course, print magazines have been acting as extensions of fashion marketing teams for years. But e-commerce allows any e-tailer to launch their own digital publication, giving brands greater control over product placement. Porter Edit, published by online fashion retailer Net a Porter, uses some of the fashion world’s biggest influencers to reach new audiences. Cover girl Gisele is a recent example. These kind of editorials let the brand position itself firmly in the luxury market. There are also direct links to the garments featured in the Gisele shoot, showing that Porter Edit has a savvy cross-selling strategy that interweaves with their editorial content. How to implement this in your site’s sales copy: Successful online editorial content is a long-term investment rather than a quick-win. Start by finding out your target buyers’ main interest points. For example, luxury clothing shoppers at Net a Porter may also be interested in high-end vacation spots, expensive restaurants, or exclusive wellness treatments. Then, build lists of target keywords and topics around those interest points. Align categories or individual products from your inventory to place within each editorial topic. Lastly, set up a publishing calendar and invest in a page design that lets you cross-sell e-commerce products from your editorials effectively. Luxury market sales copy is challenging, particularly with products such as candles—there’s no tangible differentiator between a one-dollar candle and an $80 candle from Jo Malone, so convincing buyers to open their wallets is extra difficult. To be successful, luxury e-commerce sales copy has to sell the sizzle, not the sausage. The atmosphere evoked is one of intangible sensuality and wealth; compare this to the benefits-led copy of Dyson and it becomes apparent how market segment and brand voice influence on sales copy. How to implement this in your site’s sales copy: High-end copy can’t stand alone: the whole site’s look and feel needs to match the text’s focus on luxury. Take a look at these 40 examples of high-end product websites for inspiration. In terms of copy, use longer product descriptions that include the stories behind the heritage or manufacture of a luxury product, and evoke the feelings you want the purchase to inspire in shoppers—exclusivity, wealth, opulence or innovation, for example. Copy is powerful. It can connect you with your audience, explain why your products are a good choice, and ultimately encourage customers to make a purchase. But sales copy isn’t easy to write or create, requiring a solid knowledge of brand tone and position, as well as deep understanding of what drives your customers to buy. By investing in sales copy throughout your e-commerce store, you can make consumers see the true value of your product and brand. This is the first step on the road to creating lifelong customers and better revenues. A strong white-labeled financing offering can help lift conversions and maximize both sales and cart size by ensuring consumer confidence and highlighting your brand. 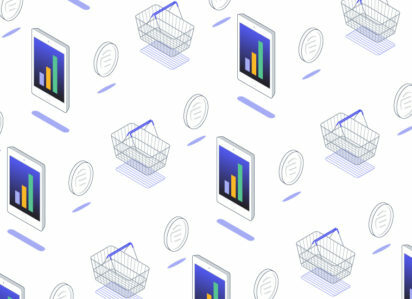 Ecommerce metrics can get overwhelming—that's why we've made a complete guide on how to calculate and strategize using these benchmarks. $4.6 trillion in ecommerce sales are lost to cart abandonment each year, and the average cart abandonment rate is 69.86%. 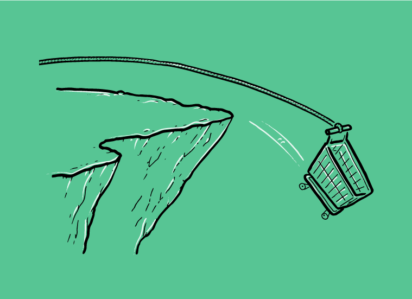 We'll show you how to turn cart abandonment around.